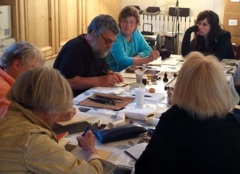 Our workshop offers Artists and Art-lovers a unique opportunity to study egg tempera and/or watercolor technique, study great Italian art treasures, explore the charming culture of an Italian Hill Town while sampling magnificent Italian wines and cuisine! Your leaders, Fred Wessel, Professor Emeritus and Jeremiah Patterson, Associate Professor at the Hartford Art School have exhibited internationally. They have run workshops in Italy since 1986 and cultivated a vast knowledge and passion for Italian art, culture, cuisine and wines, which they are eager to share with you. Their workshops weave these elements together with full painting days to ensure a complete cultural/art workshop experience. This year’s workshop will allow you flexibility in studying and learning the classical and unique techniques of Fred Wessel & Jeremiah Patterson’s two favored mediums: Egg Tempera & Watercolor. Together, Fred & Jeremiah will offer an intensive painting instruction experience including lectures, live demonstrations, critiques and ample scheduled painting time. If you prefer to work in an alternate medium they will also instruct you in the painting/drawing medium of your choice. 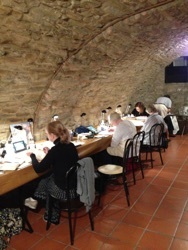 This workshop offers a unique opportunity to hone your painting and drawing skills in studio, while living amongst Tuscany’s most breath taking landscape and studying many of Italy’s great art treasures. Your stay will also be filled with many opportunities to enjoy Italy’s finest culture….the art, wine, food, and history of this beloved country. The workshop is open to all levels of expertise from beginner to advanced.